And so the Masaaki Suzuki Bach Cantata cycle draws to a close. Like the similar Harnoncourt/Leonhardt and Gardiner projects, it’s been something of a pilgrimage, and there is a real feeling of ground covered and experience gained in this final volume. But there has also been an impressive consistency of standard and style across the project, with many vocal soloists appearing from beginning to end, and instrumentalists often returning for many volumes. Adopting SACD when it became available about half way through the project was a smart move, not that the audio standards had been lacking previously. In fact, the exact opposite: the sound engineering, the quality of the orchestral playing and near ideal acoustic of the Kobe Shoin Women’s University Chapel all contributed to recordings that really made the most of the higher resolution that SACD offered and showed the technology off at its best. Masaaki Suzuki clearly isn’t the sentimental type, but he’s allowed himself the small indulgence of a one-page introduction at the start of the liner, looking back on his original plans and considering how it has all worked out. In 1995, his official line was that the cycle would take “at least” 15 years, but his anticipation that it might take longer was not based on concerns about his own industry or that of his colleagues: he was harbouring a dream that a significant number of the lost cantatas would be discovered over the course of the project, theoretically extending the repertoire substantially. That never happened, as he now ruefully admits, but the sense of optimism that this attitude demonstrates has been one of the defining characteristics of his music making throughout the cycle. 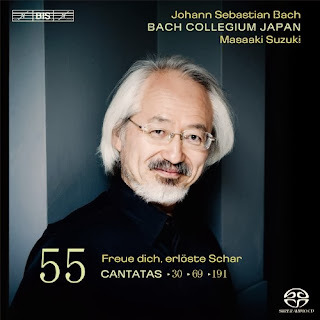 Suzuki’s roughly chronological approach brings us out at the end in the 1740s, with three very late cantatas, which, as luck would have it, are all grand, celebratory works, making for a fitting and satisfying conclusion. However, Bach’s habit of recycling material has a significant impact on the later works in the cycle, and there is very little music here that has not previously been recorded under another guise earlier on, albeit in different contexts and usually with different words. But no matter, these performers always make Bach’s music sound fresh, and the quality of both the original music and the later adaptations is never in doubt. Lobe den Herrn, meine Seele, BWV 69, was written for the inauguration of the Leipzig City Council, probably in 1748. The music is fittingly grand and regal, with a large orchestra often creating thick instrumental textures through doublings between the families. As ever, Suzuki and the BIS engineers balance the music finely, even in the tuttis. So, for example, in the opening chorus, the harpsichord in the continuo is as clear as the trumpet (the inimitable Jean-François Madeuf) it is heard beneath. Suzuki’s control of instrumental colour is also exemplary, and when, later in the chorus, Bach merges the trumpet sound into that of the oboe, the transition is seamless. The choir is clear and precise throughout, making even the complex counterpoint of this cantata sound easy, and the vocal soloists, all familiar names by now, give performances as good as anything in the previous volumes. There is a touch of other-worldliness about Robin Blaze’s countertenor, but again it is never taken to an extreme and adds an interesting colour to the mix. Freue dich, erlöste Schar, BWV 30, was written for the Feast of John the Baptist, 24 June (Johannestag! ), but is based on a secular cantata Bach wrote to a Picander libretto with an allegorical theme: Time, Happiness and Fate all appear in the original as sung parts. It is an interesting exercise to try working out which of them each of the singers correspond to at any given moment, and Peter Kooij is surly Old Father Time in his aria “Ich will nun hassen…” A great performance here from Kooij, lyrical and well supported, without any hint of failing vocal powers, as occasionally happened in earlier volumes: he’s proved the cynics (myself included) wrong and kept the quality going right up to the last volume. And to conclude – a truly glorious work, Gloria in excelsis Deo, BWV 191. The music here is lifted almost directly from the Gloria of the B Minor Mass, so the compositional quality is of the highest possible standard. So too is the performance, even better, it seems, than when the same forces tackled the Mass itself some years ago. Having the music extracted to form a shorter work gives Suzuki the opportunity to present it in a lighter, less histrionic way. The results are ebullient and bubbling with energy and joy. The exact reason for the composition/arrangement of this work is not known, but a plausible theory has it that it was to celebrate the end of the Second Silesian War in 1745. Here it provides the celebration for an ending of another sort and the ideal conclusion to a spectacular cantata cycle.